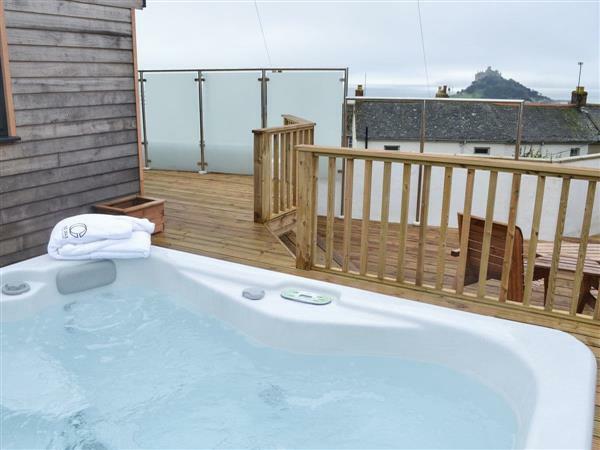 Sea-Esta in Marazion, Cornwall sleeps 2 people. Sea-Esta in Marazion is tucked away in an elevated position, with views to St Michaels Mount and the sea; this delightful and contemporary detached studio will appeal to couples looking for a relaxing hide away. Sea-Esta is perfect for a romantic getaway, with large bi-folding doors opening on to an extensive decking area and hot tub, with outdoor lighting to create a wonderful ambiance. The property is welcoming whatever the season, and bathrobes are included to add to guests comfort. The area benefits from good transport links including the train station in Penzance and a good local bus service. Penzance, ’the gateway to west Cornwall’, with its busy harbour and town, offers an outdoor swimming pool/lido and a wide promenade leading round to the quaint fishing port of Newlyn and the pretty scenic village of Mousehole. The location is perfect for exploring the legendary Land’s End, Sennen Cove and Lamorna Cove. Do not miss a visit to the Minack Theatre, cut into the cliff face with the ocean as back drop. Take the coastal train from nearby St Erth into St Ives, passing some of the area’s most beautiful beaches. For excellent days out, there are also a wide choice of gardens and National Trust properties. The beach is 500 yards from Sea-Esta in Marazion. With the shop also 500 yards, and the pub is 250 yards. The restaurant is ½ mile from Sea-Esta. Sea-Esta in Marazion is all on the ground floor. Electric central heating (underfloor in shower room), electricity, bed linen, towels and Wi-Fi included. Welcome pack. Enclosed decked area with garden furniture. Hot tub (private). Private parking for 1 car, 500 yards; additional on road parking. No smoking. Please note: There are 6 steps to the decked area. Holidays at Sea-Esta run from Friday to Friday. For a better idea of where Sea-Esta is, you can see Sea-Esta on the map below. Sea-Esta is in Cornwall; should you be on the lookout for a special offer, you can find all the special offers in Cornwall. It's always worth checking to see what is on offer at the moment. Do you want to holiday near Sea-Esta (UKC2718), you can see other cottages within 25 miles of Sea-Esta; have a look to find your perfect holiday location.